With the exception of urban residents, most American homes and gardens host at least one of the approximately two hundred and fifty different native snake species. The green Snakes button on the left leads to a section of the site that provides pictures and information to help with basic snake identification questions. Inviting the local garter snake, or any snake to be a guest can be as easy as putting down a rug next to a a wall, deck or patio. Inevitably a garter snake will call the place under the rug home. On the other hand, the typical human fear of snakes creeps out many a homeowner who accidentally crosses paths with the mythical snake in the grass in their back yard. Fear not, a few snake control tips for the home and garden greatly help reduce the probability of having snakes as uninvited guests. In introductory terms, the fear not didcum also applies because the vast majority of snakes found in residential areas, such as garter snakes, king snakes and racers, belong to the nonvenomous Colurbridae family. That leads to the first snake control tip for squeamish homeowners. Don’t panic, the odds are very high the snake won’t hurt anyone. Their back yard presence poses little risk to individuals and pets. Furthermore, with the exception of rattlesnakes, the range of North American venomous snake (coral snakes, copperheads and cottonmouths) is restricted to the Southeast and southern border states. Rather than posing a potential problem for people, residential snakes actually beneficial many homeowners because they consume a variety of pests such as slugs, snails and rodents. For snake squeamish people unconvinced about a snake’s utility, a variety of options are available to manage residential snake populations. When considering issue of house snakes, the most important thing to remember is that apart from pet snakes kept in enclosed housing, snakes that successfully wander into the house always lose their welcome status. Snakes belong in the yard and not in the house. Remaining level headed ranks as tip number one for snake control in the house. High energy activity around snakes tends to startle them, prolonging the problem by scaring the snake into hiding. Consider the snake in the picture at the top of the page, and consider the difficulty of removing it from its hiding place between the thin cracks in the bricks if it’s startled. Impossible, right? Assuming that the snake is fully visible on a floor, staying calm, slowly approaching the snake in order not to startle it, and then placing a trash can or box over the snake will keep it cornered long enough to slip a piece of cardboard underneath the trap, carry it outdoors and release it. In some instances, depending on the location of the snake, opening the nearest door, slowly approaching the snake and gently shooing the snake toward the doorway with a broom often solves the problem because the snake wants to be outdoors anyway. Using the end of a rake or other long handled tool to trap the snake against the floor in order to keep it still for live removal purposes also represents a good strategy. If all else fails, the more expensive professional pest control options always remain available. 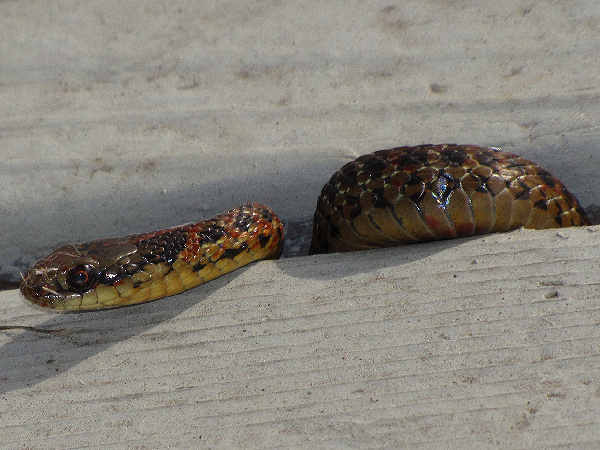 Snake control in the garden and yard present some challenges, and successful snake control depends largely on the type of garden and/or yard in question. Large gardens and yards without fencing, for example, provide ample opportunities for snakes to roam as they please. Small, fenced gardens and yards may provide sufficient snake barriers, providing they are maintained in a manner that discourages snake occupation. 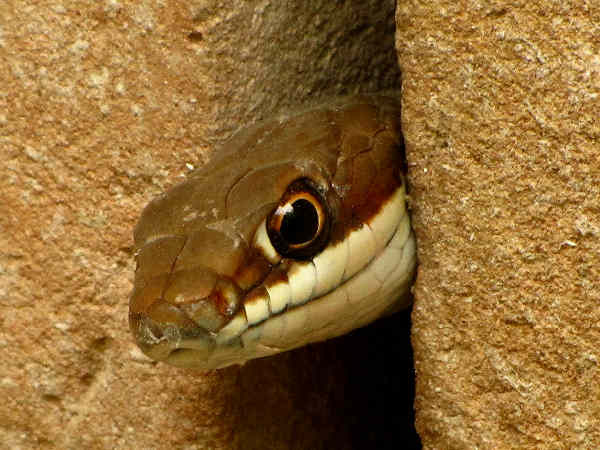 As cold blooded reptiles, snakes seek food, shelter and warmth. Removing those factors from the yard provides little incentives for snake visits. Tall grass, with weeds, for example, provides opportunities for snake food sources to flourish. Consistent lawn care such as mowing and weed removal reduces those food sources. Removing snake housing options can be as easy as looking around the yard. Stacking wood under a porch to keep it dry, for example, provides snakes with a potential dry home. Fabric places around shrubs to manage weeks also provides adequate snake shelter. Snakes even enjoy the warmth provided by a carpet folded up on the porch or in the yard. Keeping a tidy and clutter free garden and yard discourages snakes from settling in for the season. Remember, an ounce of snake control prevention is always better than a pound of snake control cures. Contrary to some old tales about the utility of chemical snake controls, extension service specialists across the country discount the effectiveness of any over the counter or home made snake repellents. Additionally, placing toxic chemicals around the yard presents its own dangers to roaming children, pets and other wildlife.